Fast: Your Diamonds 2000 is hosted on a state of the art data center strategically located on the fiber optic hub of the U.S. ensuring optimized speed. Secure: With enterprise-grade internet security, your vital information is protected. Reliable: With 99.999% uptime guarantee, you can be sure to have access to your Diamonds 2000 when you need it most. Anywhere anytime access from any device: Access your Diamonds 2000 anywhere there is an internet connection. No hardware or software required: You don’t have to install or support any hardware or software on your local system. Your Diamonds 2000 is fully managed, monitored and maintained to ensure optimum Diamonds 2000 performance. Did you know that the folder “Diamonds 2000” includes some unique access to your information and also includes some freebies? Certs – Shortcut: Access to all your certificate images. D2000 Search: A scaled-down search that anybody in the office can use. Diamonds 2000 price list loader: Brings new prices from the RapNet server to your Cloud Server; This is a $150 program included in your cloud subscription. Diamonds2000.com: Shortcut to our website. Diamonds 2000: Shortcut to the Diamonds 2000 program. Images shortcut: Access to all your jewelry images. Manual: Shortcut to Diamonds 2000 manual. TeamViewerQS.exe: A quick way for me to access your screen. We’ve found a great Fax Service! Say goodbye to landline and old fax machine! It’s affordable, easy to setup and will add a professional touch to your business. Starts from $36 a YEAR! And one-time $25 to port your fax number! And we will refer you as our friend/customer. Internet fax service – no fax machine required. With Fax Service you can receive faxes in your email inbox and fax out any document from within Diamonds 2000 or any Microsoft Windows® application. Your subscription includes a local or toll-free phone number, free fax software, and many other features. If you have any version of Diamonds 2000 you are ready for our new D2000 IMAGE Export program. 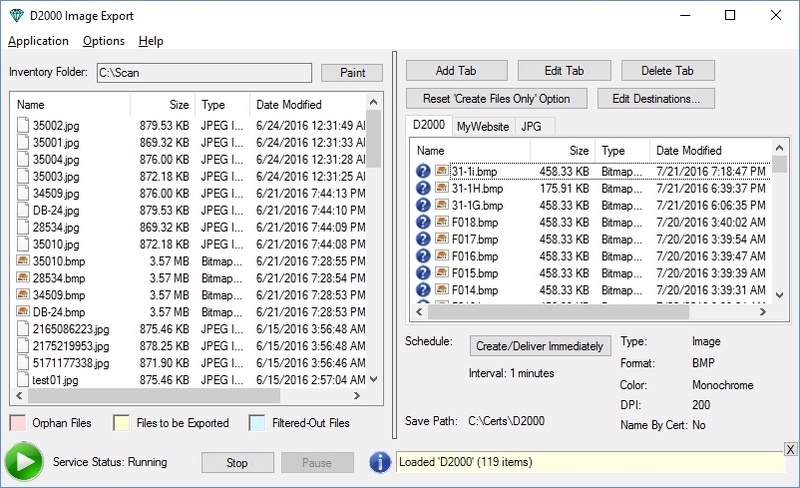 This program will Converts certificate images scanned for Diamonds 2000 into different image formats (rename file to certificate# and Zip them if necessary) and delivers the files automatically to an e-mail account or upload to a FTP server. You don’t need to do a thing just scan for Diamonds 2000 and D2000 IMAGE Export will do the rest. Your setup options are: Scheduled time or Time interval. In this new D2000 IMAGE export program we emphasize on giving Diamonds 2000 users the edge over other diamond programs. 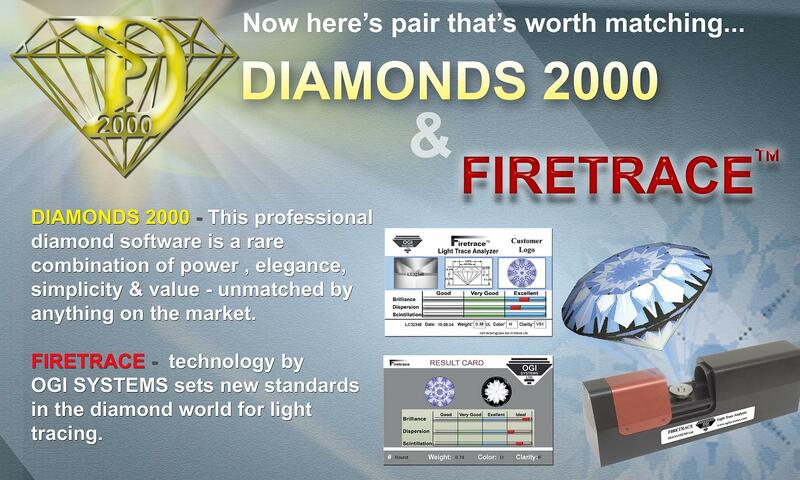 Bar-Code System programmable with Diamonds 2000, D2000 Search and Inventory Tracking for Diamonds 2000. This optional feature can be purchase to improve the speed and accuracy of Searching, entering new Memos, new Invoices and checks your Physical Inventory too! 1. 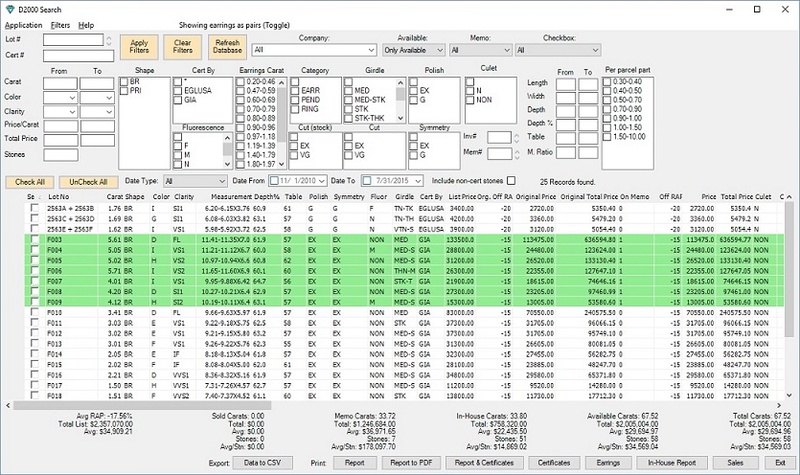 DIAMONDS 2000 Software with Bar Code interface labels. This will enable you to print Bar Code labels for all or part of your inventory parcels on your laser printer. 2. Bar Code Reader. Any Bar Code Scanner that can read code 39 may be able to read the Bar Code on the parcel label. However, the IMAGTEAM 3800 Scanner can be programmed to enter stone details automatically into Memos and Invoices. 3. The DYMO LabelWriter is key component. This printer simplifies label making by allowing you to print one label at a time. Additionally there are two labels (see below), which can only be printed with the Smart label printer.